The winner of last year’s New York City Marathon, Shalane Flanagan, will be running again in 2018. Here's how she fuels up for a race. While many of us might think that marathon runners follow super-strict (read: bland) eating plans, 2017 TCS New York City Marathon winner Shalane Flanagan is on a mission to debunk the pervasive myth that healthy eating can't be full of flavor. 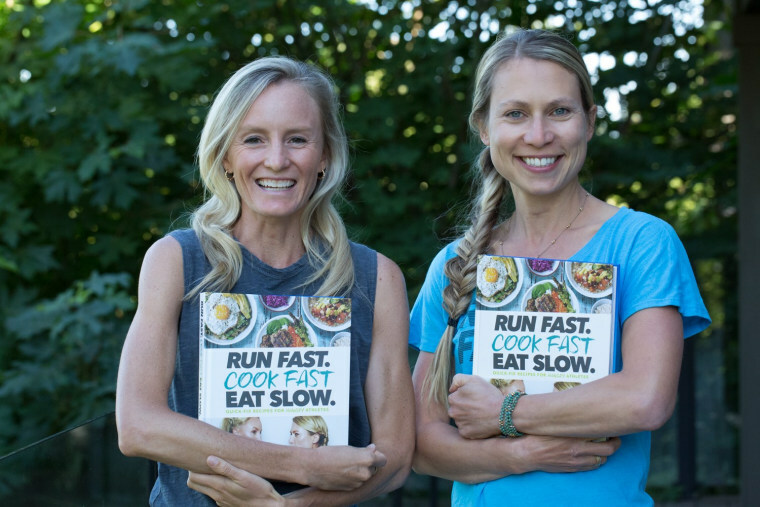 In Flanagan's latest cookbook, which she co-wrote with pal and chef Elyse Kopecky, "Run Fast. Cook Fast. Eat Slow. Quick-Fix Recipes for Hangry Athletes," the long distance runner shares some of her favorite recipes — and tips — for preparing nutritious and delicious foods around the clock, regardless of your fitness goals. "Eating right also means enjoying what you eat," Flanagan told TODAY Food by email. "So many runners think of food simply as fuel, but there is so much more to healthy eating." Not only is Flanagan the reigning New York City Marathon champion, but she's a four-time Olympian, and is ranked as the third fastest American marathoner in history. In 2017, she became the first American woman to win the New York City Marathon in 30 years. She and Kopecky previously published a 2016 New York Times best-selling cookbook, "Run Fast. Eat Slow. Nourishing Recipes for Athletes." "A whole foods diet doesn’t have to be bland and boring," said Flanagan. "The most important thing is simply spending time cooking real food." During peak training seasons, Flanagan, who typically runs more than 100 miles every week at her home in Portland, Oregon, said she's been craving soups and salty broths after sweating a lot. "Right now I’m craving all of the hearty soups and power bowls in 'Run Fast. Cook Fast. Eat Slow'," said Flanagan. She loves tucking into a protein-packed bison chili, a superfoods soup loaded with beans and a chicken soup with cannellini beans. When she's craving something sweet, Flanagan goes for a treat she named Superhero Muffins (especially the pumpkin spice and chocolate peanut butter cup versions). In collaboration with Eleven Madison Park chef Daniel Humm, the pumpkin spice Superhero Muffins will be sold at his new eatery Made Nice in celebration of the TCS New York Marathon on Sunday. Proceeds will benefit New York Road Runners free youth programs. On race day, Flanagan powers up with oatmeal in the morning. But she doesn't just eat it plain. Her original variation includes bananas (which are loaded with potassium), almond milk, a pinch of salt, berries, honey and cinnamon. Flanagan said that she does limit sweets, but admits a weakness for doughnuts. However, as someone who loves burgers and salads, she added that, "Luckily, I can still eat most of my favorite foods." For those just getting started running long distances, Flanagan advised finding a friend with whom to train and make sure to include cross-training in your routine, in addition to progressively adding more mileage to runs. But, she added, all the training in the world can't overcome a lack of sleep and improper nutrition so it's important to fuel each run with a healthy combination of whole grains and protein. When asked about currently trendy eating plans like the ketogenic diet and paleo diet, Flanagan said that, in her own experience, eliminating an entire food group (in her case fat) wasn't a great idea. "Avoid following a trendy diet that will leave you feeling hangry!" she advised. Instead, she recommends seeking out high-quality meat and produce by shopping at local farmer's markets. If you're trying to be more conscious of what you're eating, there's a pretty simple way to do that: make it yourself. Said Flanagan, "The single greatest thing you can do to eat right is to cook everything from scratch and limit packaged foods." But, of course, after a big race, it's important not to deprive oneself. What does the winner of a marathon eat after crossing the finish line? Flanagan said the first thing she ate after taking top honors at the 2017 New York City Marathon was ... drum roll, please ... a giant slice of New York City pizza!